Throw it in pasta, toss it in a salad, smear it on a sandwich, and don’t even bother trying to resist gobbling it straight from a spoon! This vegan pesto packs a flavor punch from fresh basil, garlic and a tough of fresh lemon juice. The best part: it whips up in minutes! The first time I tried to make pesto, it turned out horrible. I used dried basil. Oops. In my defense: I was twelve at the time. Still working on my culinary skills! Anyhow, I’d had pesto at our local Spaghetti Factory and fell in love. I’m not sure I followed a recipe. I probably asked the server what was in this delicious sauce and thought I’d stuck gold when I realized mom had all the ingredients on hand. But no, she really didn’t. In case you were wondering, pesto made with dried basil is a chewy, disgusting mess. So yeah, this recipe uses fresh basil, and is far superior to my original pesto recipe. And also, this one is vegan! I’ve made lots of versions of vegan pesto, and although they were all a million billion times better than pesto alla dried basil, most were probably more complicated than they needed to be, simply due to the fact that conventional pesto has cheese and I thought replacing that would be super complicated. Turns out, cheese isn’t that big a deal in pesto. It adds some zip, texture, and saltiness. So my vegan pesto has a little bit of lemon juice for zip. Bonus: lemon is also delicious and refreshing and goes great with fresh basil. In past versions I used nutritional yeast for zip, but you know what? It really doesn’t need it. And I think it actually tastes better without it. Nuts take care of texture. 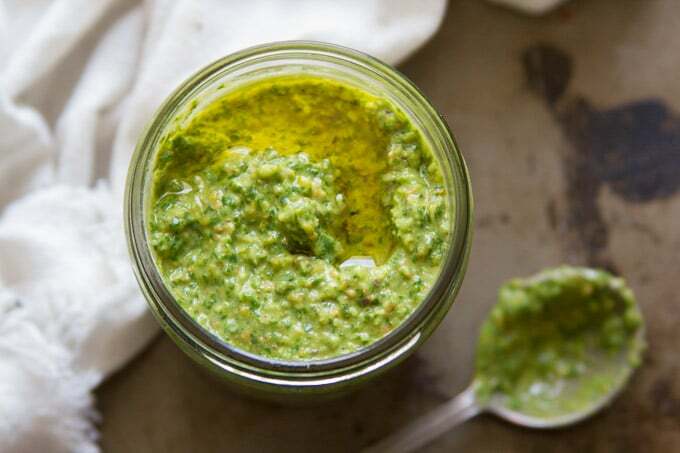 Traditional pesto uses pine nuts, but I went with pistachios for this recipe because I actually like the texture better. Also, they’re way cheaper and keep longer than pine nuts. And as for saltiness, I added salt! Making vegan pesto is easy! Throw a bunch of ingredients into a food processor and blend it up in the food processor. Give it a taste. Does it need anything? Add it now! It’ll probably be a bit thick at this point, so run it through the food processor a second time and drizzle in some additional olive oil as you do, just until the consistency is right. Don’t use dried basil. Haha! I hope you figured that out by now, but just in case. Walnuts or (more traditional) pine nuts can be subbed for the pistachios. 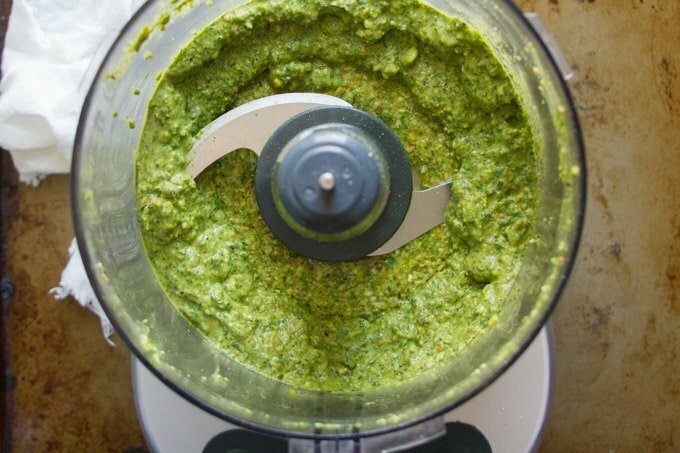 Your homemade vegan pesto will keep in a sealed container in the refrigerator for 4-5 days, or in the freezer for about 3 months. Throw it in pasta, toss it in a salad, smear it on a sandwich, and don't even bother trying to resist gobbling it straight from a spoon! 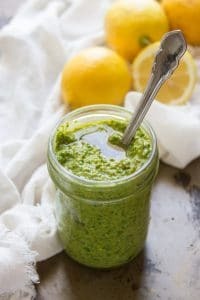 This vegan pesto packs a flavor punch from fresh basil, garlic and a tough of fresh lemon juice. The best part: it whips up in minutes! 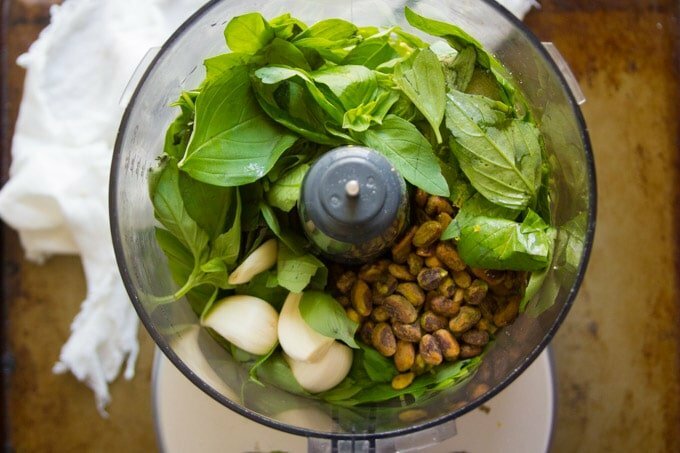 Place the basil, pistachios, garlic, 1/4 cup olive oil, lemon juice, zest, and salt into the bowl of a food processor fitted with an s-blade. Blend until all ingredients are finely chopped, then drizzle in the remaining olive oil with the food processor running. I hope to enjoy “freedom” sometime in the next few months, ha ha! Fingers crossed I’ll be able to leave my job and blog full-time. :) I didn’t know you were a lawyer! Do you know what you’re going to do? This pesto looks delicious! Pesto is my favorite food; I love trying different variations of it. Pinning to make later! This was actually a post from last year. I just shared it again because I updated the photos, which is kind of funny because I just looked at the post and realized it included an announcement that I was going to start doing that! I don’t know where to purchase nutritional yeast. Please tell me where you obtain yours and the cost. I’m glad you enjoyed it!! Thanks Celia! Pesto is one of my favorite condiments, if that’s the right term for it. I usually use walnuts, but will have to give pistachios a try! I taught my bf how to make pesto years ago and he’s a total addict, too. I also gave him my favorite pesto tip: freeze it in ice cube trays, then empty the cubes into a freezer bag. You can throw cubes into various soups and things during the cold months, after that last basil harvest. SO yummy! I had some awful experience with a similar recipe. The pesto turned brow, just the top part ot it, I guess it oxidated. After some research I found out that the best thing is to use the plastic blade. Have you had any problems with that? Do you know any tips? Thank you so much! 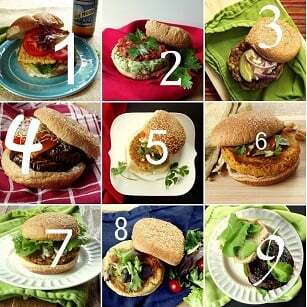 :) I love all the recipes you post! such an inspiration!!! Too bad where I live can’t find most of the ingredients (the fancy ones), but I manage to adapt things just fine. Huh…I’ve never heard that about plastic blades! I’ve also never had a problem with pesto turning brown. Was the recipe you followed oil-free by any chance? I think the oil should help protect it from oxidation. Also, with this recipe I think the lemon juice should help! Hi- I’m one of the few who has never tried pesto. Are the pistachios raw or cooked? Is it possible to use more lemon juice and cut back on the oil? They’re roasted – most shelled pistachios you see at the store are. You could probably cut back on the oil, but be careful about adding too much lemon juice or it will be very tart. I’d use a mix of lemon juice and water, and make sure to taste-test as you go. Good luck and I hope you enjoy it! I’ve never tried pistachios in pesto before but that must be delicious! Looks so good! Thanks Jess! It’s so good!